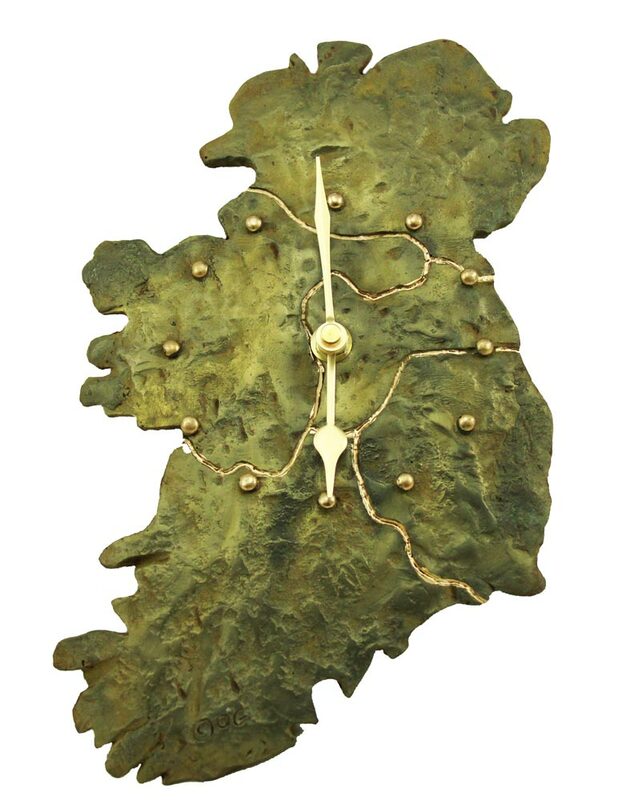 This is a beautiful clock in the shape of the island of Ireland, depicting the five provinces (or kingdoms) of Ireland as existed from the 5th century to the 12th century – Ulster, Leinster, Munster, Connaught and Meath (Meath, once the seat of the High King of Ireland, eventually merged into Leinster). 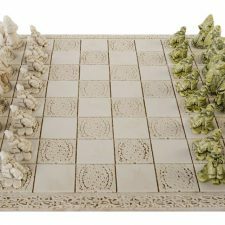 Handcrafted by O’Gowna, Dublin, Ireland, using a mixture of bronze and limestone, with a beautiful green and shimmering gold colouring effect. Read our Blog on the Five Provinces of Ireland as depicted by this clock. Ireland Clock = Irish Times: by the artist, Philip Gafney, O’Gowna Studios, Co. Dublin, Ireland. The Irish over time have had a disproportionate effect on the world from this tiny island on the edge of the Atlantic. Many great adventures have started here, from Brendan on his voyage to discover America, to Patrick who came here to discover himself. This island’s unique shape is like an old friend with outstretched arms calling you home or the family member waving you goodbye as you leave for the next part of your adventure. 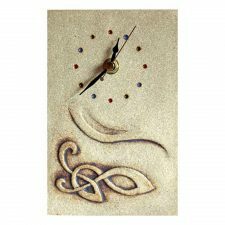 The Ireland Clock is created and handmade by O’Gowna, Naul, Co. Dublin, unique artisan gifts from Ireland. 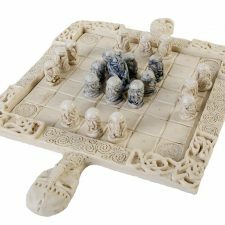 Dimensions: measures approx 29cm x 20cm. This clock has brass coloured hands and hour buttons. The Ireland Clocks are handmade and so there may be slight visual variations, however, the same high quality of craftsmanship applies to each clock. The mechanism of this clock is German made, the quartz movement has been regulated at the factory and should give years of accurate timekeeping. Takes 1 x AA battery (not included). recently purchased the Ireland Clock through “Totally Irish Gifts”. From start to finish I was agreeably surprised with the great service I received. Shauna was so professional in every way and I received my order very promptly. It was beautifully packaged and I was so impressed that I then ordered a further two clock , which were gift-wrapped free of charged and which also arrived within a day of me ordering them. I will be using “Totally Irish Gifts” whenever I need a gorgeous gift for somebody – buy something today from “Totally Irish Gifts”, you will be more than happy! gift for my son in Canada. He is very happy with it and described it as “beautiful and unique”. I was very happy with the courtesy and help in dealing with the order. Sent an Irish Clock to my friend in the States for a present she wrote to tell me she was thrilled with the whole concept of it being a Totally Irish Gift and how it will always remind her of home when she looks at the time. A gift well purchased. If anything, this item exceeded my expectations. Looks great on my wall and keeps perfect time. Very happy I purchased it. Absolutely loved this product, beautifully crafted could recommend it more. 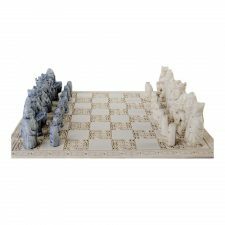 I bought it as a gift for fathers day and they loved it. Fast service. ordered at night and came after one day! also email correspondence very prompt,needed to change delivery address, was done the same night, very happy with totally irish gifts!! Product is brilliant. Website organisers are extremely helpful. I made an error while ordering which ment it would not go through correctly (my fault) and they contacted me and it was all sorted nice and quickly. Great product and service. Lovely gift. Very impressed with simple transaction and very fast delivery. Highly recommend Totally Irish Gifts. Delighted with the product that I purchased, very fast delivery, product looks exactly as described on the website. Thanks. Today I am in receipt of the Irish Clock… customer service from order placement to receipt has been exceptionally pleasant and professional. This high quality clock crafted in Ireland was ordered just one week ago and looks great in my California home.I look forward to excellent Customer Service as I plan to do Holiday season shopping with this company and to share this Great Find with friends and family. Well crafted and looks beautiful. Absolutely delighted with it and great to be supporting Irish Artists. I received my order and I am very pleased with it. Thank you for your assistance, can’t wait to give the couple their gift! !